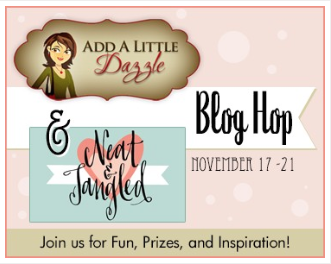 Hi everyone and welcome to the Nat & Tangled + Add A Little Dazzle Blog Hop! You should have arrived from the Add A Little Dazzle Blog - if you haven't - you can find the entire Hop order at the bottom of this post. We're sharing projects that use both companies' products for the next three days - so hop along - there are also prizes to be won! There are $25 voucher's for both companies waiting for you - how awesome is THAT?! Here's the card I made using he Baby Blue Metal Sheet from Add A little Dazzle and Little Santa Girl from Neat & Tangled. You all know I'm not a super bug fan of those cutesie girl-images with big heads, but I seem to like this one a lot. (And coloring is fun!) I embossed the metal sheet with a cuttlebug snowflakes-folder - a very simple card with a lot of impact! Now it's time to hop over to Martha Lucia Gomez who's waiting with a great creation. Hope you have lots of fun! Love the metal peeking out from behind the vellum! Beautiful card using some of my favorite things, metal, vellum and a darling image. Gorgeous card - as always - cool metal sheets! This looks smashing! Love that blue metal! Very cute and I like the embossed metal. This card looks great. A wonderful combination. Its always amazing to see how a simple detail like embossing the metal makes such a huge difference in the look of a project. Really lovely! I love the card and the embossed blue is awesome and the stamp is cute. Good job. I love the blue metal sheets and the snowflake embossing! I'm not a huge fan of the little girl stamps either, but I'm changing my mind ! That girl has a hip look that feels more modern. Thanks for your work ! I love the embossed metal background and the snowflakes! Love how you can see the embossed metal through the vellum. Very cute. The vellum over the metallic sheet is a very pretty effect and I love your coloring. Oh my gosh! 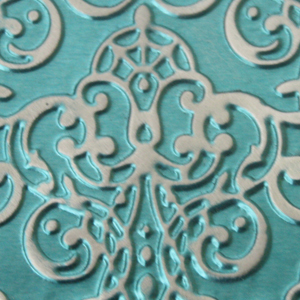 The embossing on the metal sheets is gorgeous! The colors are fantastic and your coloring is perfect! Thanks for sharing! Simply gorgeous, love this darling image and the peeking of fab embossed metal sheet! FAB colouring Christine and I LOVE the embossed Add a Little Dazzle! I like that embossed metal!! The card is so sweet! 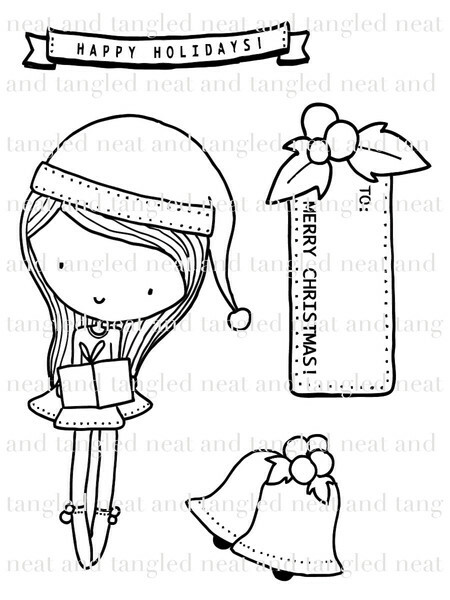 Hi Christine, Your cutesie Neat & Tangled Little Santa Girl is totally cute, it must be the way you have coloured her in! Awesome talent! Have you used Monica's AALD metal craft sheet to create a gift as well....sure looks it to me! I think you have created an outstanding card. Congratulations! Thank you for the inspiration as I love the design element to the top of the card base. Cheers! Great design; love the vellum over the metal embossed sheet! such a cute image, too! Stunning card, a lot of WOW with the embossed metal sheet, and easy peasy too! So a beautiful card and love the touch of glitzy blue down the side! Just gorgeous! Gorgeous card! Love the embossed foil with the vellum over it, that anchors your lovely Christmas girl. Fabulous blue metal on your card! That is so pretty! nice card. I love this sweet little Christmas card! Adorable! So cute! I love how you used the metal sheet and the velum. Just so cute! Adorable card! Love the embossed metal sheet on the background and that darling Little Santa Girl! Beautiful card Christine!! I love the way you colored your big headed little lady (ha ha ha!)! That metal sheet is super awesome! What's not to love?! So so so cool!!! As usual! Just a darling little card.Love the innocense.